The new EnerG+ HEA-21522-MI water resistant hanging gazebo infrared heater uses clean and odourless infrared technology so it is totally safe for family, friends and relatives. It is ideal for: gazebos, patios, balconies, workshop, garage, etc. Very decorative, it blends beautifully into your environnement. 3 individually activated infrared lamps. Triple power 700 - 800 - 1500 watts. The patent-pending Dyna-Glo HeatAround 360 Elite is the only portable recreational heater that provides 360 degrees of warmth. It's compact, vesatile 360 design makes it the ideal choice for grab and go heat. The oxygen depletion sensor allows safe indoor use, for emergency heating. No electricity and no batteries are required, as it is fueled by one or two 1lb propane tanks (not included). It can also be connected to a 20 lb propane tank for outdoor use, with an optional hose/regulator (not included). The HeatAround 360 ships completely assembled, and it includes two swivel regulators to easily attach up to two propane tanks. The piezo ignition lights quickly and easily, it heats up to 450 sq feet, and it is adjustable from 13,500 BTUs to 18,000 BTUs. It also includes a safety tip-over shutoff switch, just in case. The Dyna-Glo HeatAround 360 is an outstanding solution for grab-and-go portable heating. The Hea-21548-BB portable electric heater ushers in a new era in outdoor heating. Its tough design makes it perfect for heavy duty environments such as construction sites or garages. It requires no gas or other flammable fuels therefore zero carbon monoxide emissions making it cost effective and environmentally friendly. Hanging Infrared Electric Outdoor Heater with Remote and LED Light The new EnerG+ HEA-21522-MI water resistant hanging gazebo infrared heater uses clean and odourless infrared technology so it is totally safe for family, friends and relatives. It is ideal for: gazebos, patios, balconies, workshop, garage, etc. Very decorative, it blends beautifully into your environnement. 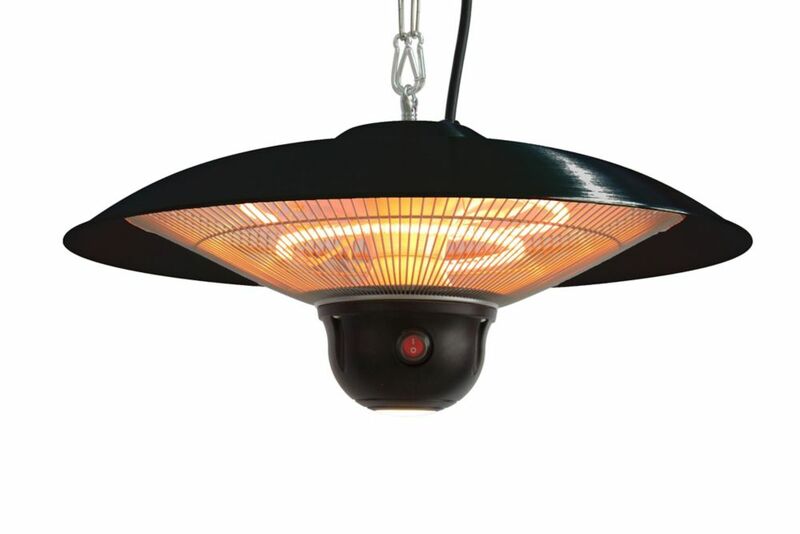 Hanging Infrared Electric Outdoor Heater with Remote and LED Light is rated 4.2 out of 5 by 6. Rated 5 out of 5 by Gaetz from Works very well We use it to keep warm in spring and fall on our second floor balcony. It makes the short Calgary summer feel a wee bit longer...Easy to use, remote works well. Rated 4 out of 5 by Bryne from Does an adequate job We bought this to warm up early mornings on our deck so we can have breakfast outside. It does a fair job of warming up the space but you need to sit right below it to feel it’s effect. If it’s windy we also close our curtains around our gazebo to keep in the heat in. Rated 3 out of 5 by Mike from Heater Fine, Remote Questionable Purchased in January to keep the 24' x 24' garage above freezing. The infrared heater is effective enough to maintain a temperature above 5 degrees Centigrade even when it's -40 outside. The remote control does not install a lot of confidence. It has to be very carefully pointed directly at the heater from a few feet away to turn on the unit. I'm afraid it won't last.